Part 22 of my series of Kiss reviews, leading up to the release of Monster! I’m generally not going to be covering DVDs, but this one was crucial to me. I heard a lot of these versions so often, that they were the “original” versions for me. So I have a soft spot for Animalize Live Uncensored. This video was recorded live at Cobo Hall, Detroit Michigan December 8th, 1984. It has never been released officially on DVD, although as you can see there are unofficial versions to be had. 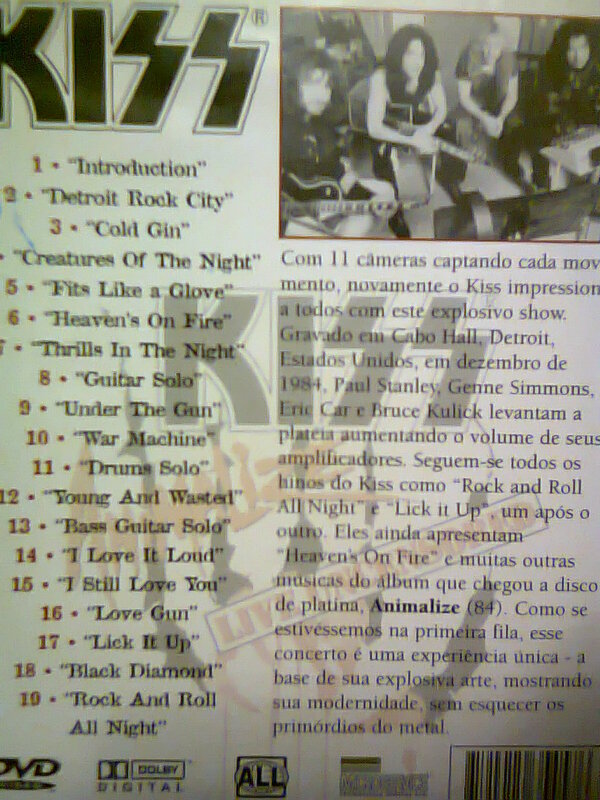 (It’s clearly unofficial since it has a picture of Carnival of Souls era Kiss on the back!) Annoying subtitles are the only real drawback to the DVD. There’s not much crossover between this and the two Alive albums, as it leans heavily on newer material (Creatures, Lick It Up, Animalize). The tempos are, in general, faster. The energy is high, and Paul is singing at the peak of his talents. The solos by Bruce Kulick are flashy in that 80’s sort of way, which isn’t my thing. Basically this is 80’s KISS, like it or lump it. I like it somewhat, probably due to nostalgia. Visually, Gene and Paul are all over the stage, while Eric stands on his drums and demands to be seen and heard. At the end, the band climb onto a flying platform. Very cool live show. One special treat was Eric’s lead vocals on “Young and Wasted” and “Black Diamond”. I also quite enjoyed Eric’s drum solo. Gene’s bass solo is nothing much to speak of, just a chance for him to introduce “I Love It Loud”, but far more musical than solos past or present. Actually he only speaks twice on the whole DVD. Before “I Love It Loud” he says to the crowd, “Oh yeah? Ohhh yeeeah? Well alright, come on.” And then at another point Paul says, “How you doing Gene, alright?” to which Gene responds, “Welll ooooooohhhh yeeeeaaaah!” Quite comical really. Paul’s raps are some of his all time classics. “Paul, what you are doing with a pistol down your pants?” (“Love Gun”) His story about Gene’s “little child” (“Fits Like A Glove”) is also classic. His guitar solo is nothing special, I guess Bruce Kulick was just too new to the band to warrant a big solo? 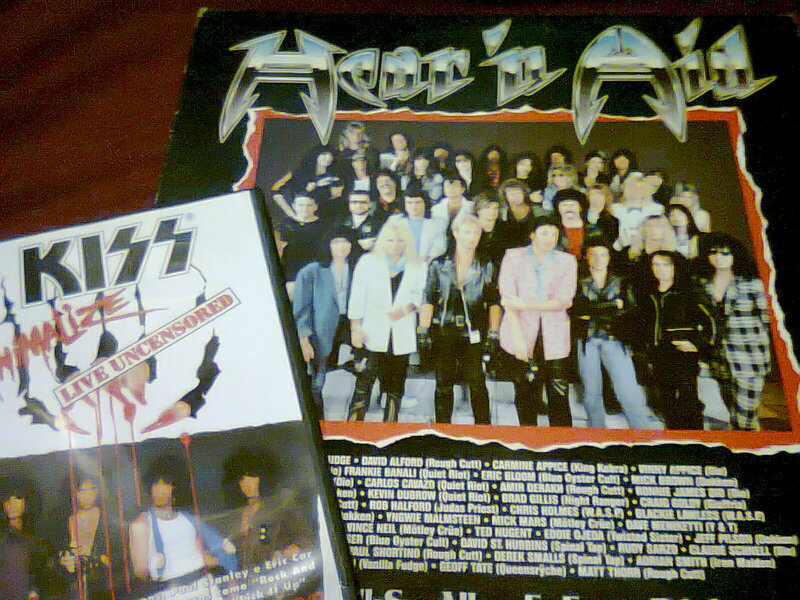 The fact that Paul has one is somewhat a rarity in KISStory. The video quality of the DVD is fairly low. Don’t quote me on this, but I think I heard that this concert is going to be reissued on the next installment of the KISStory DVDs. There are several CD bootlegs (incomplete however) of this concert. The only live audio from this concert to be officially released was “Heaven’s On Fire”. 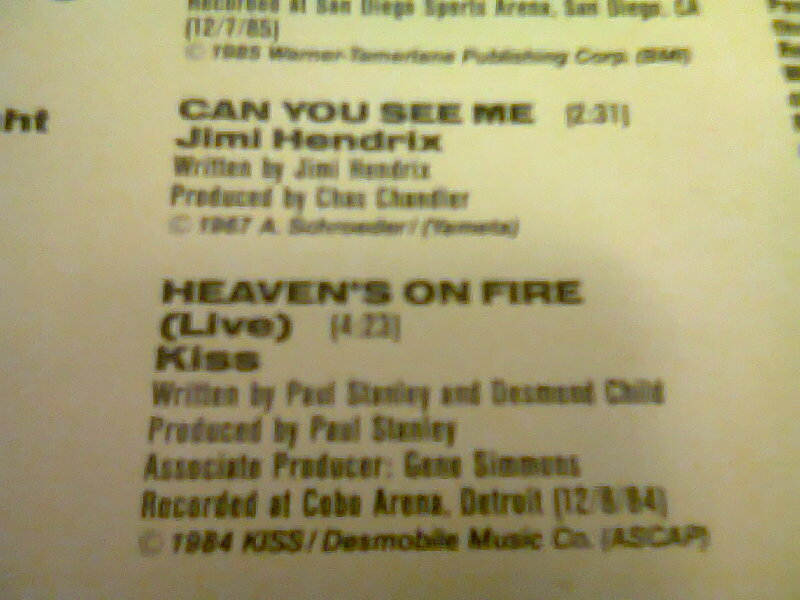 Kiss contributed that track to Ronnie James Dio’s Hear N’ Aid LP (also being reissued!) which donated proceeds to feed people in Africa.